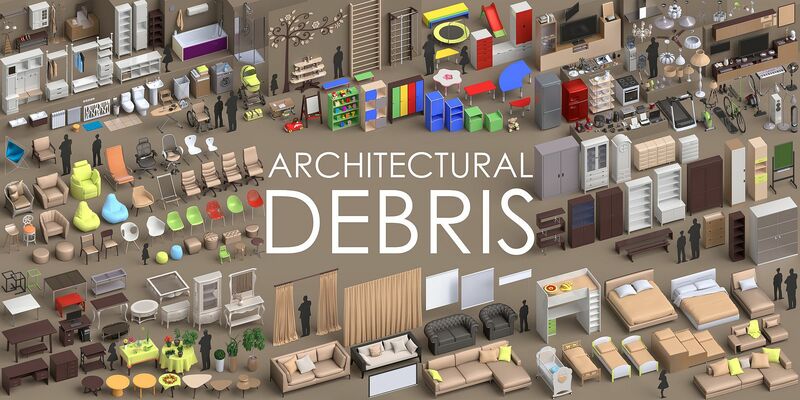 Architectural Debris is collection of common effectivepoly placeholders. Product was created to give an answer to a question - what else can be placed into interior scene? Every placeholder represents average size of natural objects frequently used for interior visualisation. 82Mb blend, 370 objects, 600 000 vertices, about 1 million triangles, 100% quads for entire scene. = Architectural sketching and interior design. = Distant, massive or quick visualisation. Object names contains definition name, mesh names contains size in millimeters. Metric scale, human's silhouettes and planes 1m2 and 1ft2 was placed for comparsion and proper scaling. Planes also have all materials of scene assigned for quick acces and materials navigation. Materails are temporal and begins from MM_ prefix, so they can be easily found in scene and replaced with needed. No textures, except unique checker map, applied to all materials in scene. Composition of title picture is divided into 8 sections, every section is presented in previews, so every item of product can be found with wireframe in preview pictures. 2 picture sets in the begining (x2 demo) are collections of most tiny items of the product. Product also includes DXF 2000 file with 2d blocks of most objects in the product. File can be used with AutoCAD, Inkscape, Corel Draw, Illustrator, any other CAD/vector software so you can draft your design in your favorit 2D cad/vector editor, or provide proper documentation of your design. Hint: Everything is unwrapped, but UV's are relative, so Texel Density Checker addon can be used to equalize object's texels. I'm an architectural designer and this pack is exactly what i needed to help clients visualize their interiors. Unless I'm looking for something supper specific this pack has everything I need for most projects. Everything is very well modeled, the proportions are good. The collection has a 1 foot square and a 1 meter square which makes it easy to scale everything to your desired units and scale. I've altered a few of the models for my specific use and have found everything to be set up to be easy to edit. Generally I dislike buying stuff for my free software but I've been very happy with this purchase! I'm using version 2.8 and everything works perfectly.